Plantation Hale H1 Newly Upgraded, great value on the Royal Coconut Coast! Offering resort-grade amenities within a clean, quiet and friendly atmosphere, this suite is a quality find at a comfortable price. The full kitchen provides everything you need to cook decadent, tropical meals, while the outdoor BBQ sites provide a poolside space to grill up local delicacies. 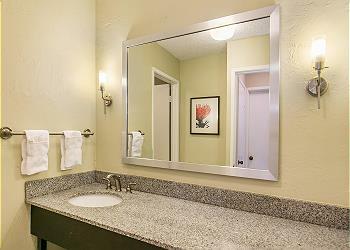 Enjoy the bright, tasteful interior design and convenient ground-level location. 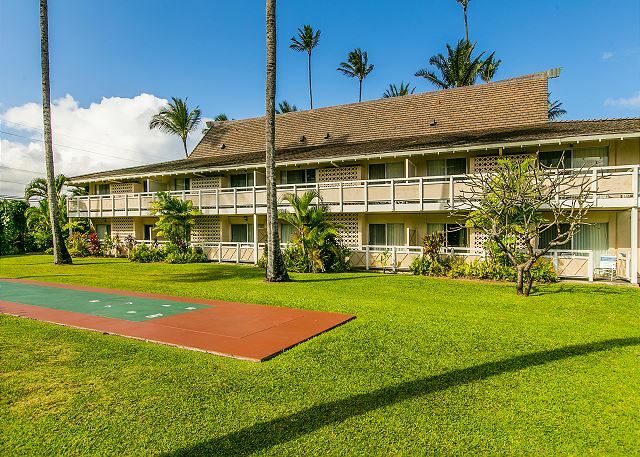 Step right onto the shuffleboard court from your private porch! 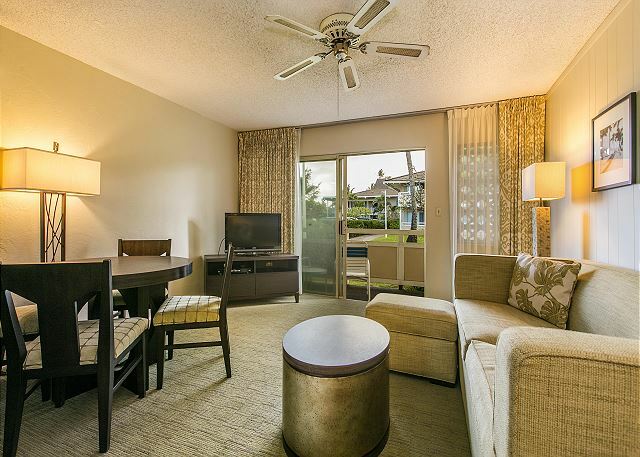 Comfortably sleeping 4 with two full beds, this stately suite has a Hawaiian contemporary flair that will set your vacation off to a great start. 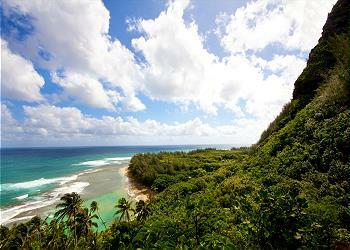 - Located in Kapaa (East Shore). 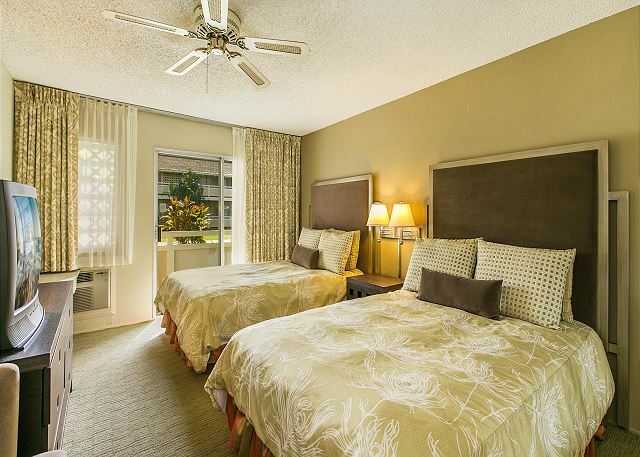 - This friendly resort offers clean and updated amenities with the appeal of convenience, comfort and exceptional value. - Outfitted with A/C, a laundry room, three pools, two jacuzzis, two shuffleboard courts and BBQ sites. 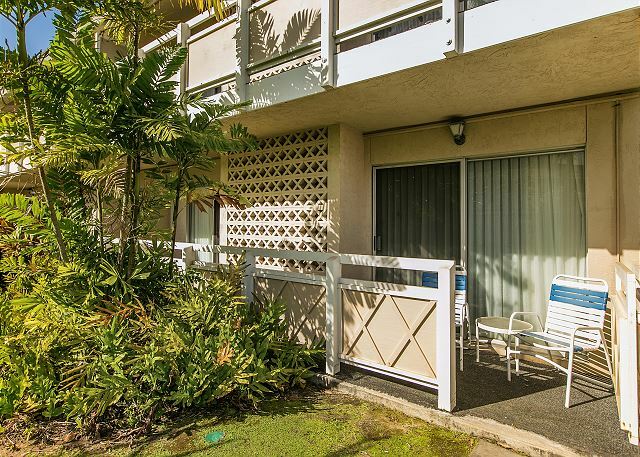 - Centrally located along the coconut coast, 100 yards from the beach and walking distance to a the newly renovated Coconut Marketplace shopping center and restaurants. 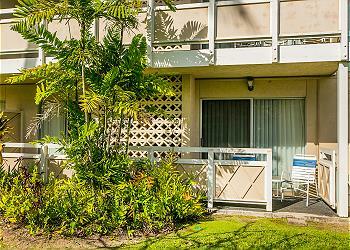 This unit was perfect for us - close to beach and some shopping (including General Store with friendly help)! Pools were clean and quiet. 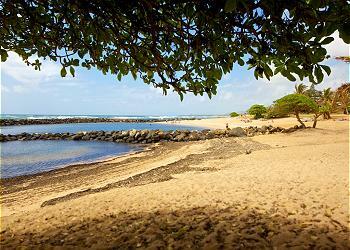 The location is just before the Kapa'a traffic - another plus. Easy to rent, owners stay in touch, definitely will recommend- hope to return! Check in was quick for a 9:00 pm arrival. The unit was well laid out and had most everything we needed. Two small but important problems - no salt and pepper shakers and the carpeting could definitely be shampoo'd or replaced as our white sport socks turned black on the soles quickly. Shoes off when entering was not adhered to by previous guests. Lots of traffic at certain times during the day requires planning when doing a day trip. Lots of shopping nearby including groceries, restaurants, shave ice etc. Longs Pharmacy at one end of the property and Coconut Market at the other end. We enjoyed our stay. The unit was very clean and comfortable. This was our second time staying at the Plantation Hale complex. H1 Plantation Hale was perfect for my stay. Clean and welcoming, and also well stocked with essentials for a vacation. Snorkel gear, iron/board, cooler, grocery bags (no plastic bags on Kauai), TP, sunscreen, dishes and linens just to name a few. Patio off the living room and bedroom that was nice to sit and have coffee. 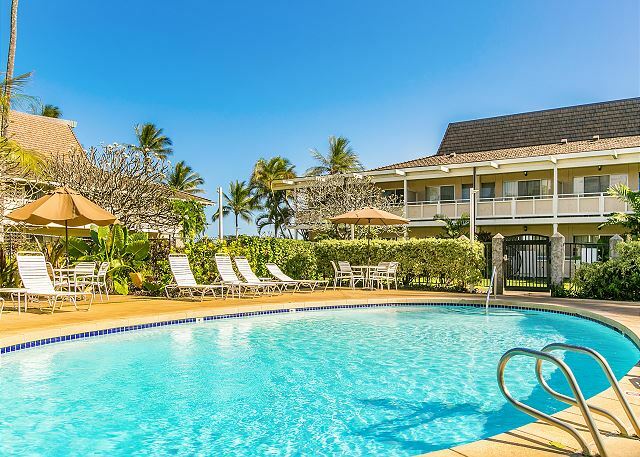 Multiple pools on site, and walking distance to the beach and several options for shopping, dining and/or drinking. I’d definitely recommend! Good place to stay. The pool with the large hot tub was down. The rest was good. Great location, Nice unit - beautiful island! Plantation Hale H1 - Loved the ground floor location, the extra items inside that we used daily (cooler, ice pack, sand mat, beach chairs). All the furniture in the unit was comfortable. Great location and short walk to several bicycle rentals and the paved bike path. Great central location on the island for going to North and south shores. We did a lot of hiking in all parts of the island. Highly recommend renting bicycles and do the bike path - very beautiful! The few needed improvements are: replace the stove. It works, but just barely. It did work for what we needed though. The bedroom could use more lighting - always seemed dark even with all lights on. Overall though, great location, good price - I would recommend to others looking to stay in Kauai. Lastly, Kauai Exclusive Mgmt was great to work with - answered any questions quickly. This one bedroom condo met our needs. The rental company that handled it for us was very friendly and there to help us. We were even able to call them and have them call the property to request early check in. This only took a few minutes and was very much appreciated. The condo provided everything we needed and more! There was sun screen and lotion for us to use and beach towels, beach chairs and a beach umbrella and cooler and ice pack that we used daily. We cooked many of our meals here and the kitchen was sufficiently stocked. Pots, pans, bowls, dishes, glasses, microwave, sponges, dish soap, paper towels, even spices and cooking oil. I was very pleased there was even a blender! The A/C in the bedroom was nice. Note there isn't A/C in the living room. Just a vent that blows air from the A/C in the bedroom into the living room. There is a fan we placed in front of it but that didn't help much. We were there in fall so it wasn't that hot. In summer, it would have been too hot for me. One minor issue was that the stove was old and the burners didn't work well but we made it work. The toaster also was temperamental. The beds in the bedroom are doubles so really only good for one person. We didn't use the pull out bed in the living room so cannot comment on that. TV in living room and bedroom was nice and lots of towels and even starter bathroom supplies and plenty of toilet paper. Our first family vacation with the 2 kids! Last November, we had our first family vacation with our 2 boys (4yr & 9 month old). 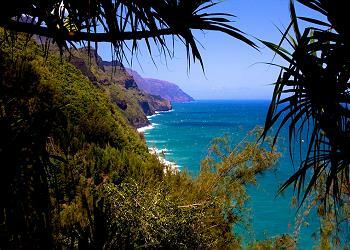 Hawaii was great, the property was great, as was our vacation. We enjoyed having pools handy just to hang out and cool down. 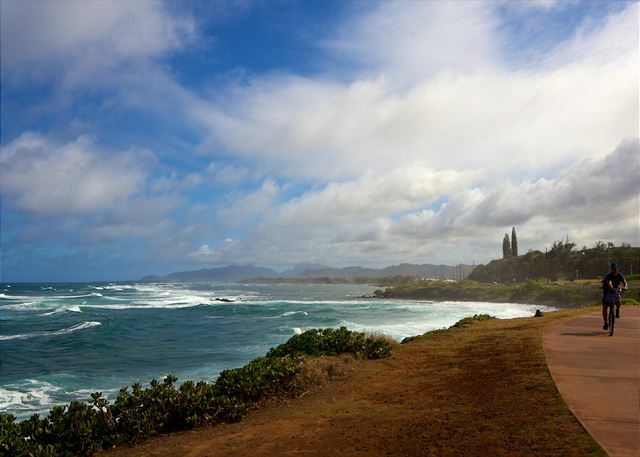 Kapaa/wailua is very central on the island which is nice! The nearby coconut market was still being renovated but still had stores/shops for anything you may need (and free entertainment on certain nights). The owner, Patrick, was very responsive and helpful. The only thing worth noting is that the beach facing the property is not really swimmable (at least not in november) as it is rough and rocky, but perfect for morning walks. 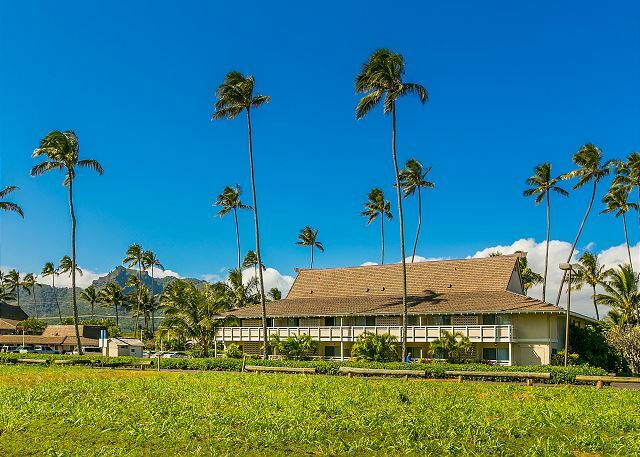 Not if, but when we return to Kauai, we wouldn't hesitate to stay at plantation Hale again! Mahalo!